The Melbourne Expedition – Days among the dead: The Dawson Angel. | The mind is an unexplored country. So dubbed because he stands atop the resting place of Michael Dawson in Melbourne Cemetery. I haven’t been able to discover much about Mr Dawson. Today I suspect he is remembered only for this colossal image – and I do mean colossal. The angel himself is close to three metres high, not including the base. In all this magnificent and unsettling structure stands about as high as a two-storey house. Unsettling? You bet. Apart from his size the Dawson Angel has suffered far less damage than most of his fellows. There’s some mould but otherwise he seems intact. One of the archangels, perhaps, Michael or Gabriel. 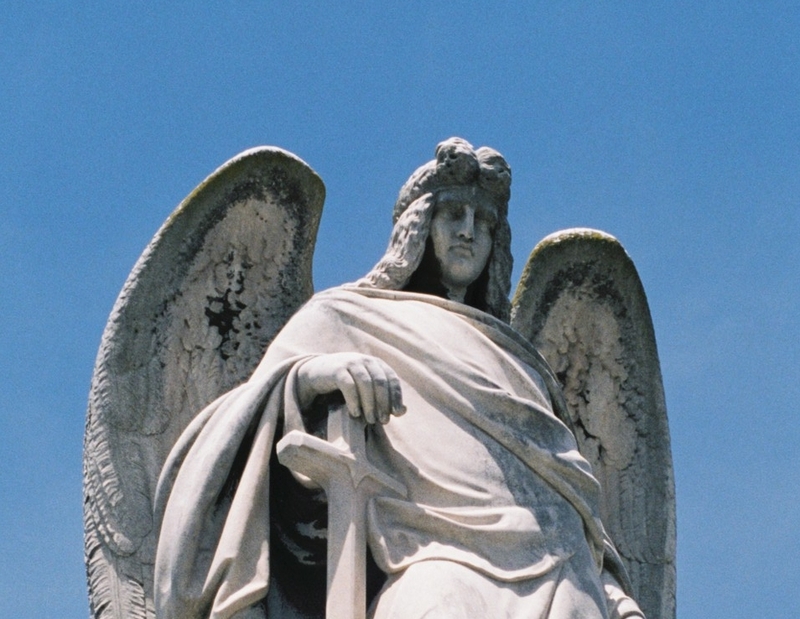 The war against the rebel angels is over, Lucifer and his minions have been cast out of Heaven – and now, with the battle done, the Dawson Angel casts his eye over humanity. He seems unimpressed. Disappointed. Possibly downright pissed off. He’ll rest on his sword a while to contemplate the situation. But if he takes action – expect no mercy. The words of one VERY pissed off angel. « The Melbourne Expedition – Days among the dead. Umm, err, isn’t the above defeating the purpose of being angelic? Not of YOUR words of course, but the VERY pissed off “angel”? Let’s just say that the movie that quote comes from gives the whole Angels – Devil – Humans – God interaction a radical twist. Practicing my Spanish, for when Barry, by edict, invokes God knows how many millions his new immigration laws. Allows new voters, for Lefty cause. As in I ca bote, keel peopls, and sel drug, too.